Chances are, you might already know if Bloodborne is the sort of game you'd enjoy. Created by the team at From Software, their latest release is a dark and menacing beast that will chew up unsuspecting players and spit them out, without so much as a warning. Bloodborne is the newest entry in the "Souls" franchise, so players can expect a lot of frustration, repetition, and eventually the joy of victory. The notorious difficulty is still the main gameplay attraction, however there is more here than meets the eye. If you've never tried the Souls games, or didn't enjoy the time you spent with them, Bloodborne is a different animal that may change your mind. With a more action-oriented approach, this could be the game that turns you into a fan. 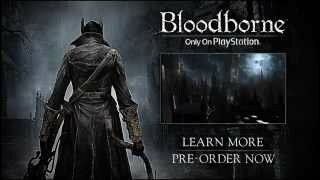 Players assume the role of a traveler that arrives in the city of Yharnam. It is quickly discovered that a horrible event has occurred here, and the whole town has been infected with some kind of illness that transforms men into creatures, and also spawned all kinds of monstrosities. Players will navigate this city and its outskirts in search of a cure, while also unraveling the origins of the disease and other secrets of the local populace. To put it bluntly, Bloodborne is not a game to play for its clear, engaging narrative. Like the Souls games before it, storytelling here is extremely minimalistic, convoluted, and not very engaging. Thankfully, other aspects of the experience more than make up for a lack of a cohesive plot; still, the dedicated and lore-obsessed fans will likely make sense of it all. Regardless of your history with the Souls games, Bloodborne is a sequel that tweaks core gameplay mechanics enough to produce a wholly different experience. It's much more of an action game with RPG elements, instead of the other way around as its predecessors were. But you still begin as we always must, by customizing your character and choosing an origin story, which determines your starting level and how many attribute points are allocated to the stat categories of Vitality, Endurance, Strength, Skill, Bloodtinge and Arcane. Most are self explanatory; Vitality governs your health pool, and Endurance determines how many dodges and attacks you can perform in a row. Strength and Skill are attributes that define how much damage you deal with various weapons. Bloodtinge governs the power of weapons that use Quicksilver Bullets, while Arcane is related to magical abilities. You also get a set of Blood Echoes to start with. These Echoes function in exactly the same way as Souls in the past games. It's the game's only currency - used to level up, shop for items, upgrade your weapons, and so on. Death is a frequent occurrence, and each time your Echoes will be lost entirely, lest you go back to the spot where you were overwhelmed and recover them. Sometimes, they will even be picked up by a nearby enemy that you'll need to kill to recover them. The high risk mechanic of collecting a lot of Echoes will weigh heavily on your mind as you carry on deeper into the game's dark, twisted world. And what a world it is. 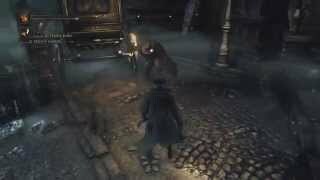 Stepping out for the first time, the dark and atmospheric Gothic streets of Yharnam are instantly oppressing. Dangers feel like they lurk around every corner, even if there is no enemy in sight. The environments are relatively small, however they offer a multitude of directions to explore, all interconnecting in ingenious ways. Multi-level, multipath zone design is stronger than ever in Bloodborne, prompting an intoxicating desire for exploration, finding shortcuts, secrets, and new areas. There's no map to fall back on, so you'll be drawing out paths in your memory and become intimately familiar with the streets of the city, and later the surrounding areas. From the underground tunnels to the deep forests, the levels in Bloodborne are all interconnected with rare teleportation lamps. You use these lamps to return to Hunter's Dream, which acts as the central hub of the game and is separate from the main world. Here, you can level up or embed new gems into your weapons for better attributes. This is also where you trade and barter with a merchant, and can teleport to any of the lamps you've lit back in the main game. It's a system that works perhaps slightly better than teleporting between bonfires. As mentioned earlier, Bloodborne is much more of an action focused experience, and this is reflected in the weapon and armor selection. There are very few weapons in the game – less than 30, a number that action fans would be happy with, but RPG players would scoff at. Similarly limited is the armor selection, and you'll be finding all armor as a set rather than individual pieces. However, the developers clearly focused on quality and variety over quantity. Each weapon – from a sword and hammer to a cane – performs differently and has its own gameplay style and move set. The longsword is slower and has a limited range but can dish out damage with good pace; the hammer does great area of effect damage against multiple enemies, and the cane may seem like a poor choice at first – that is until you discover its transformation. All weapons in the game are called trick weapons, meaning they can transform between two modes. The cane, for example, transforms into a whip that gives you greater flexibility and range. The starting weapons such as the saw cleaver can be used in its short form, or extended for much greater range and damage but slower attack. As you might imagine, this gives players an incredible amount of options to find the weapon that best fits their play style. There is a durability mechanic, but it feels like an afterthought; your weapons degrade very slowly and are cheap to repair. Weapons also have varying scalability, meaning some will do more damage if you have a high attribute rating in skill or strength. You can upgrade weapons with embeddable and swappable gems that provide passive buffs, as well as fortify them with shards that permanently increase the level and damage output. In addition to the flexibility offered by trick weapons (it's viable to complete the whole game with the starting weapons), shields are no more. This is an action game, remember? Instead, when not using their weapons in two-handed mode, players have a pistol to use. This pistol uses Quicksilver Bullets and behaves just as any rifle would, doing small damage to enemies from afar and helping you pull apart mobs with aggro. But more importantly, it also acts as your tool to parry attacks. Timing your shot well will stun your foe, leaving them open to a visceral attack from your main weapon. The first few hours of the game are probably the roughest. Getting used to the controls, dodging and side-stepping enemy attacks, and learning to recognize the windows of opportunity to land blows – all of these elements take time to learn. You can't leave the starting area of the game until you've had a chance to master these mechanics enough to defeat the first couple of bosses. And that's just fine. The controls are tight and responsive, and most of the deaths you'll experience will be due to your own lack of patience, reaction time, or being under-leveled; only occasionally the unwieldy camera will be to blame. You'll learn that losing your Echoes is not the end of the world, and if you made it to a location once, you can do it again and retrieve them. As in previous games, the enemies respawn and can be farmed for Echoes and items, and the environments are static; any shortcuts you open and items you collect will remain intact, even if you die. 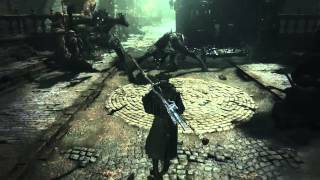 Because Bloodborne is less of an RPG, the only things that enemies will drop are health refills and bullets for your pistol, as well as items such as Blood Shards for weapon upgrades or Molotovs. Later on in the game you'll also be able to use runes, which act like rings and give you passive buffs. With no shield, the action in Bloodborne is decisively more frantic and agile than the past entries. There is a new helpful mechanic that allows you regain some of the health you just lost by landing a few hits on the enemy immediately, as retaliation. Hit and run tactics are not only encouraged, they are required. You can lock-on to enemies, which turns your dodge/roll into a sidestep instead, limiting mobility but helping you more successfully avoid incoming blows. The usage of your pistol is also key to stun-locking, helping you dish out huge damage against tougher foes. Thanks to the variety of play styles afforded by the weapon mechanics, the gameplay shines despite the perceived difficulty. Unlike perhaps in the past Souls games, dying in Bloodborne is still frustrating, but it always feels like your fault. You didn't dodge fast enough, in the wrong direction, or simply got greedy or careless with your attacks. It's never because the game is cheap or because the controls failed to detect your input. The action is visceral, with each attack carrying a satisfying feeling of impact, and losing half your healthbar in one blow will put your nerves on edge. But at least you'll be comfortable knowing that there are no cheap deaths – there are no environmental traps, no innocent looking chests that turn out to be monsters. Those elements added little to the already frustrating experience in the past Souls games, and it's nice to see them gone. Not to mention, this design choice fits directly into the game's more aggressive approach. Enemies still have the habit of taking huge chunks of your health bar, and bosses even more so. But with patience and awareness, Bloodborne is not as jarringly difficult as its advertising materials would have you believe. Where all players will probably struggle is during boss fights. After the somewhat disappointing selection of key foes in Dark Souls 2, Bloodborne's monstrosities are both refreshing and highly diverse. Each enemy not only looks and feels unique, but they vary greatly in gameplay. You will fight beasts three times your size that are relentless in their attacks, pouncing and swiping mercilessly at your health. You will also fight an angry old witch that becomes invisible, or an enemy that closely resembles a human Hunter just like yourself with access to similar attacks and weapons. Boss encounters in the game are as memorable as they are challenging, with each fight not only playing out differently from the others, but the bosses usually go through stages during the encounter that further diversify the action. These fights will often take multiple attempts; players will need to learn and recognize attack patterns, or come prepared with special items such as antidotes to combat foes that infect you with poison. But if all else fails, a hunter is never alone, and this brings us to the multiplayer aspects of the game.